The stately poise, the patrician control, the wiry strength of Jean-Luc Ponty's violin playing are what stay in the mind. The set-up of his playing does have an intrinsic balance, and he used it to wonderful effect, particularly in his solo feature in the second half where the layers of sound and virtuosity built up impressively and inexorably. It brought to mind that classic 1980's book in French about the violin by Dominique Hoppenot, Le Violon Intérieur. Its basic theory is about having the body in balance and then having the instrument in balance with the body. That is exactly what one sees with Ponty. In Ponty's hands, a standard ballad like Jimmy McHugh's Too Young To Go Steady is played with such intensity of 'sostenuto', it starts to sound like Danny Boy. It got me thinking how fundamentally far apart the approaches of Ponty and another French jazz violinist, fourteen years younger than him, and another heir to Grapelli are. It is less than a month since the sudden death of Didier Lockwood at 62 left the French jazz community in complete shock. His way was so much freer, much more impulsive, more will o'the wisp. He is sorely missed. Ponty's calm and unruffleability definitely seem to come from within, but for the spectator/listener they are also reinforced by the company he keeps. He has tended to surround himself with musicians who essentially have a busier and more worker-bee-ish way of going about their business than he does. Perhaps the extreme example of that from the past – roughly 20 yeas ago – was Al DiMeola, but it is also true of the current line-up. In the case of guitarist Biréli Lagrène it is his stylistic adaptability. I still remember my first encounter with a recording he made live at a club in Kirchheim/Teck near Stuttgart at the age of about 13. His gypsy jazz guitar playing was already a fully-formed miracle. And what the decades have brought is the facility to move into many different styles. 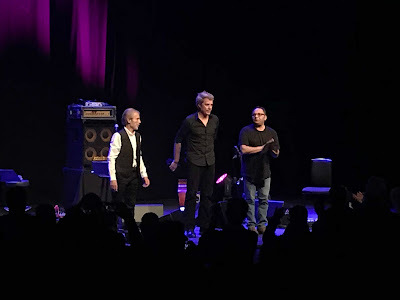 I found Kyle Eastwood to be at his most effective when playing simply, for example providing an insistently hook-ish bass line, such as on Zawinul’s Mercy Mercy Mercy. Ponty as headliner in London is rarity. The Barbican audience was loudly appreciative. Here is a very similar set from last summer .